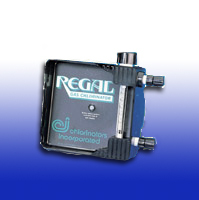 The direct-mount, all vacuum REGAL gas chlorinator is the safest, most reliable way to be sure your water is bacteria free. With a simple design (only 68 parts!) means faster servicing, less downtime, longer life, lower operating costs. The new REGAL Chlorine Gas Detectors are designed for use wherever chlorine is stored, distributed, or where potential leakage would pose a risk for personnel and property. 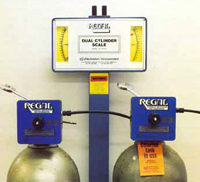 The REGAL Dual Cylinder Scale is two separate scales in one unit, with double adjustable cross-arms with chains, and provides a convenient means to measure the amount of chlorine remaining in a cylinder.